When it comes to executive Christmas gifts shopping for just the right item can be a challenge. While many people choose to purchase less personal types of items for the female executives in their lives, like generic coffee mugs and desk accessories, doing so isn’t always the best idea. I mean let’s face it, a person can only have so many paper weights, and while a number of desk accessories and coffee mugs are useful items, they often just don’t let the recipient know how much he or she is appreciated. If you are searching for a gift that conveys your feelings of appreciation for that special female executive in your life this holiday season, why not consider a unique piece of jewelry? While jewelry is probably not the first thing that comes to mind when it comes to shopping for executive Christmas gifts, it is definitely a meaningful present that is certain to make a lasting impression. There are a few unique jewelry pieces that I found here at ChristmasGifts.com that would make wonderful executive Christmas gifts this holiday season. 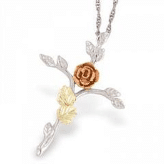 The Black Hills Gold Silver Rose Cross Necklace would make an excellent gift for that special female executive on your holiday shopping list. This exquisite piece simply radiates elegance and would be the perfect accessory for almost any occasion. The cross pendant is creatively decorated with accents of gorgeous 12kt rose gold and 12kt green gold leaves, and in the center is a beautiful rose. The necklace comes with a dazzling 18 inch sterling silver chain that includes a convenient spring ring clasp. If you’ve got a special female executive on your holiday shopping list that appreciates elegance, the Black Hills Gold Silver CZ ring is a wonderful choice. 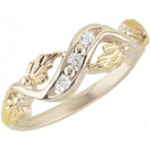 With three exquisite cubic zirconia stones that cascade along a flowing figure eight band, and beautiful 12kt pink and green gold accent leaves that add the perfect touch, this ring will make an elegant addition to even the finest of jewelry collections. Since Black Hills Gold is well known for becoming more vibrant and beautiful the more that it is worn, you can rest assured this piece will remain a treasured gift for years to come. 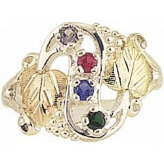 That special mother executive in your life will definitely appreciate this exquisite Black Hills Gold Silver Mothers Birthstone Ring that will enable her to carry a symbol of each of her children with her all of the time. This elegant and uniquely designed ring can include a combination of anywhere from two to six round cut birthstones, and is decorated with cascading sterling silver vines and dainty grape beads and 12kt rose gold and 12kt green gold leaves, and will be an excellent addition to any wardrobe. Black Hills Gold is a durable, high quality gold that is well known for it’s ability to become even more beautiful as it ages. Each of these exquisite pieces of jewelry would make wonderful Christmas gifts for that female executive in your life. Which piece is your favorite out of the Black Hills Gold collection of jewelry?